I've been able to get outside to paint fairly regularly since January, on my own, as well as during some workshops I've been teaching, and with small groups of fellow artists. Here's a selection of pieces from about February to June with some notes and observations. The hills around the bay stayed green for several months in spite of the drought. Depending on the position of the sun one may see the rich translucent color of grass as in the image above, or less saturated range one gets from other angles that reflect the light of the sky. Viewed through the curtain of atmosphere, even the saturated greens attenuate towards the blue. Its a range of color specific to those conditions. For several weekends in February, I would drive out towards the Pt. Reyes Lighthouse at the southwestern tip of the land, passing all the alphabet ranch properties (Historic Ranch E, F, G, etc.) This area, cloaked in muted browns during fall and winter, resembles one vast Andrew Wyeth type panorama, with windswept hills, old barns, cattle roaming the hills. 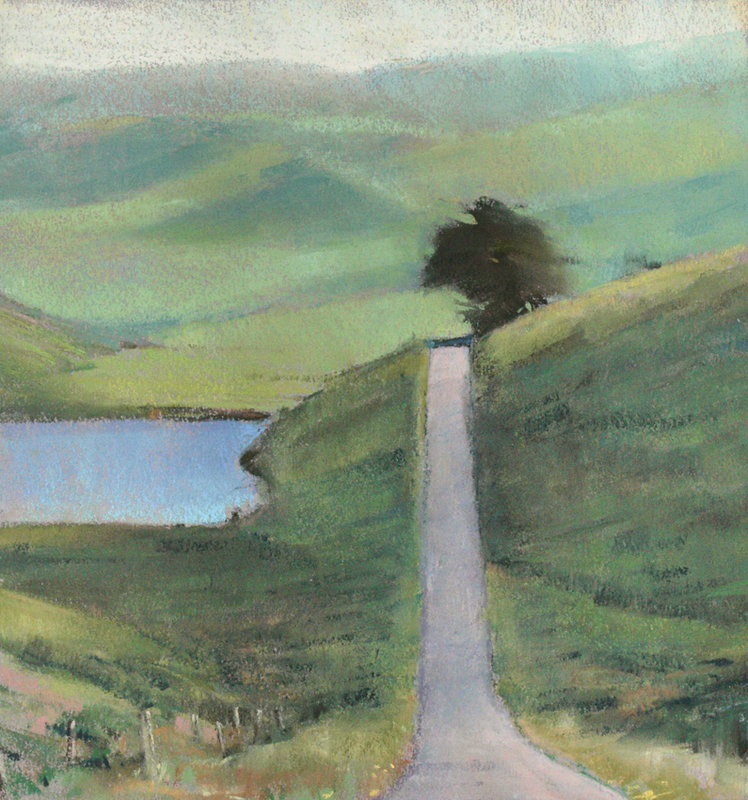 The range of green in winter and spring evokes other qualities and moods, and driving out there one constantly finds views on the way to one's destination that are tempting to paint. I must have seen this 3 or 4 times before I finally pulled over to paint it. One constant throughout the year is that any tree that has matured will betray the prevailing direction of the wind, whether it is blowing or not. In addition, this tree has been manicured to clear the road. I may still work on this one to push the road going into shadow more, as well some edge transitions. 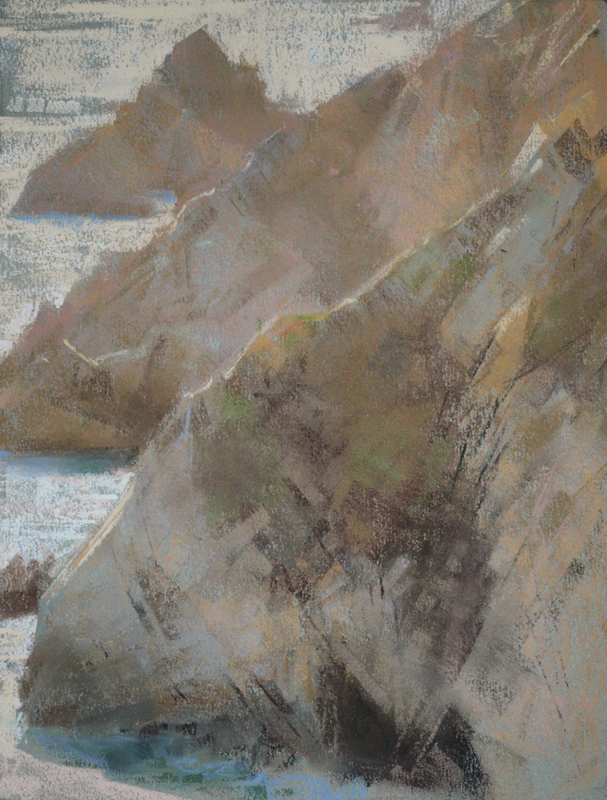 On a warm day, I will often drive into Canyon to paint. Its a narrow valley with several redwood groves in it, not far from where I live. There's a small creek that meanders alongside the road, rimmed by bay laurel, redwood, and oak, with copious amounts of blackberry and poison oak. I find that even in mid-day, one can find interesting patches of light streaming through the foliage, dappling whatever forms it comes to rest on. The challenge of these scenes is that they have a very short life span, as the dapples slide off whatever they were illuminating in a matter of minutes. Sometimes another patch of light comes along that conveniently substitutes, and other times you are left to your own devices. This is where a field sketch done prior to the start is helpful insurance. There's a few reasons dapples are so elusive. A ray of sunlight that passes through a tree has been filtered and cropped by branches and leaves countless times so that a single dapple is a brief, fortuitous alignment of numerous 'holes' before it hits the ground. The slightest breeze, and/or the relentless motion of our planet will eventually eclipse that narrow opening. Another cause is that the field of view in an image like this can be quite small, and the narrower the field, the more rapid a pinhole projection of the sun will appear to move across that space. The same effect occurs when looking at the moon through a telescope on a tripod. The more it is magnified, the faster the moon slides out of view through the eyepiece. It is simply the rotation of the earth that is manifested by these observations, whether through the telescope, or just painting in a forest on a summer's day. 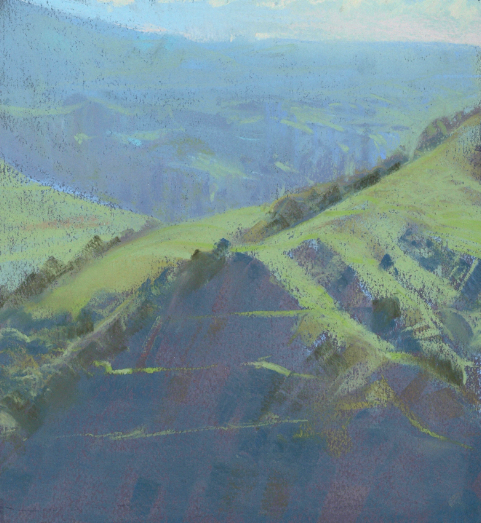 These are the familiar colors of summer in my part of the world...the 'golden' hills of California which are dotted with manzanita, scotch broom, and the small oaks that find enough moisture in the folds and seeps of the terrain. 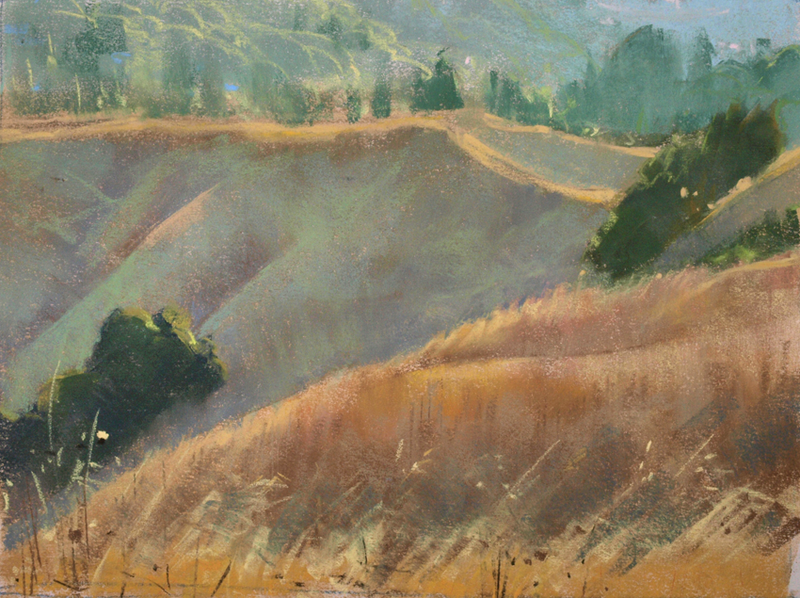 What can be fun to observe and paint is the range of color in shadow, and how that relates to the warm sunlight reverberating amongst the yellowed and reddish hues of the grasses. In shadow, the washed out, yellow grasses are subject to the cool ambient light of the sky, which can give them a relatively greenish cast on certain folds of the hills in the distance. In addition, near the edge of the shadow/light zones, the brilliant complement of colors becomes evident, which I think is due as much to the strength of natural light as to our own visual process which generates an exaggerated complementary response when confronted with a field of saturated color that changes value and temperature abruptly. I do believe that if one isolated and measured the actual colors between these two areas, they would not be as complementary as we perceive in the context of bright sunlight. So what do we paint? Color as measured in isolation, or our response to color in bright light seen in the context of other colors? I tend to err on the latter choice, as our paintings can only approximate a compressed version of the strength of natural light anyways, and the visceral, physical perception to me is an honest and personal response. Paint the effect. We are not reproducing nature. 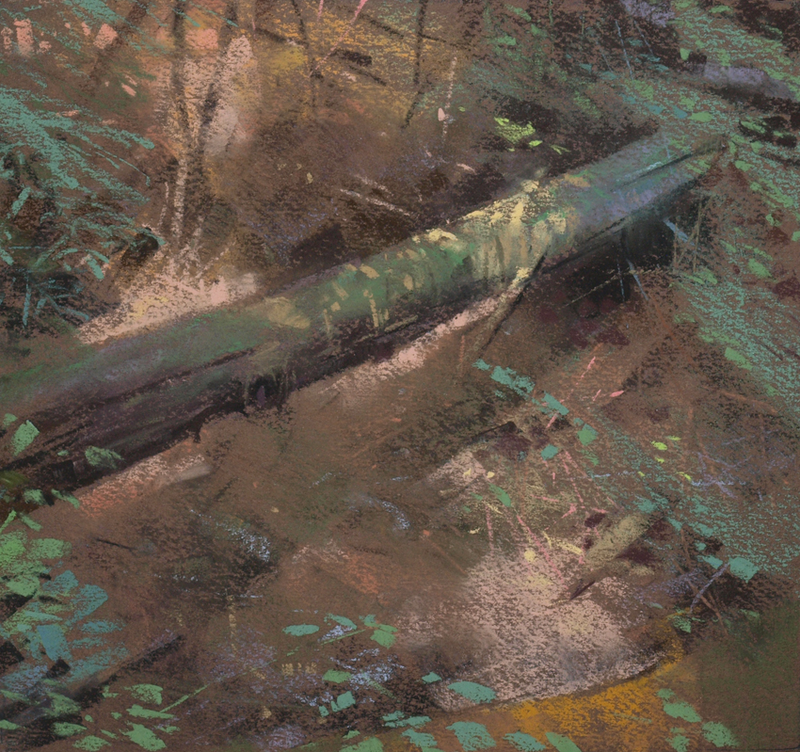 Here's another one I'll probably work on some more, or head back to the spot and do more studies. 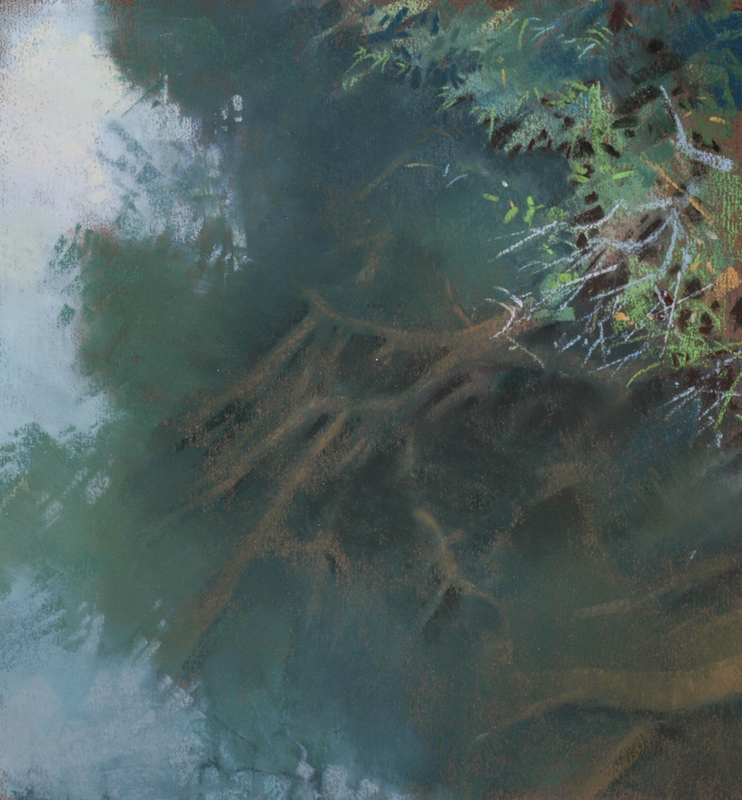 I'm drawn towards the modulation of color in the water, how the submerged branches sit 'under' the water, and the foliage textures as a pattern on the upper right. The reflection on the left also inverts the gradient of the sky along the edge of the tree. That's enough right there to convince me to do more, in order understand the play and balance of these elements better. I think there's an idea for a more refined result than what I was able to achieve in one outing. I've been reading the journals of Eugene Delacroix, and he has some very thoughtful observations about painting that are getting under my skin. It is stimulatingto have a voice talking from the 1850's, like some sort of 'art conscience' whispering in my ear.